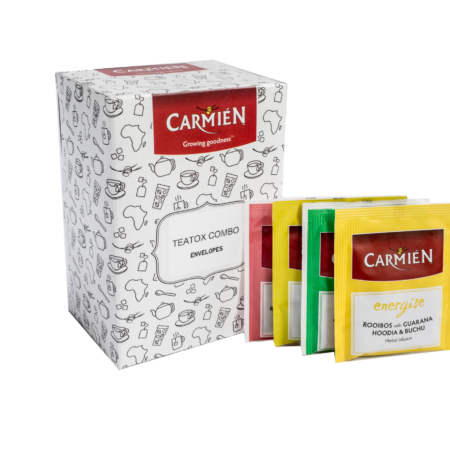 Carmién Teatox is the ideal natural way to help your body back to optimal health. 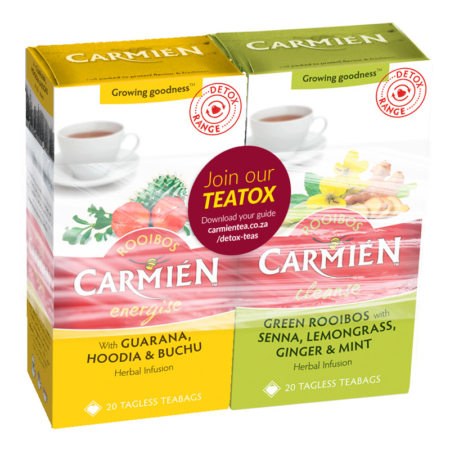 Apart from just using rooibos we have two specially formulated detox combinations in our Energise and Cleanse teas recommended for your Teatox below. Every now and then we overindulge or we get so busy that we don’t lead the healthy lifestyle our bodies require. Periodic cleansing is essential to ﬂush out the build-up of toxins from the body. If left to accumulate, these may lead to headaches, sluggishness and chronic disease, or you may simply feel bloated and tired. Your ﬁrst awareness will be an increased sense of wellbeing, more energy, reduced bloating and headaches and the increased hydration, combined with a healthier eating lifestyle, will eventually lead to better looking skin. You may experience weight loss too, however, this will not be sustainable without dieting and exercising. The Teatox products are safe to use (see Disclaimer) as a lifestyle option once you have determined how much your body needs for healthy maintenance. Follow full instructions in the detox guide. 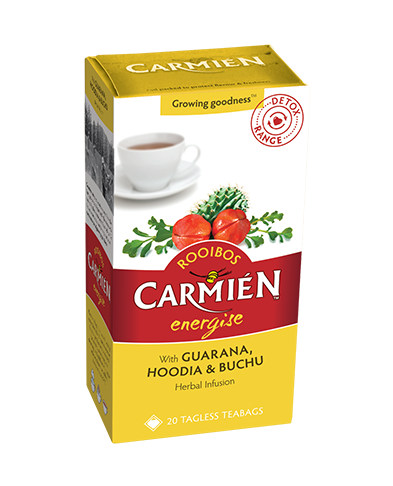 The Energise tea is a blend of buchu, hoodia, guarana and raspberry flavoured Rooibos. Best to drink in the morning to energise your day. Hoodia was traditionally used to suppress appetite and Buchu helps to reduce water retention and to flush away toxins in the body. 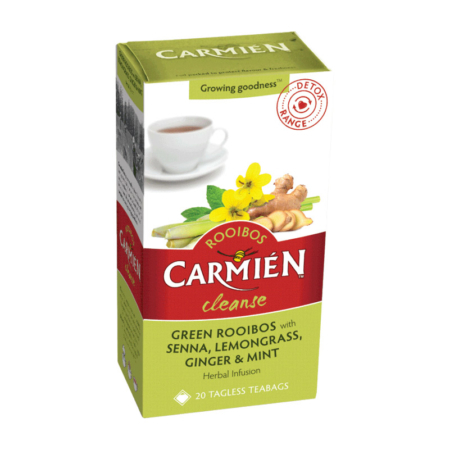 The Cleanse tea is a perfectly selected blend of natural herbs, senna, lemongrass, ginger, spearmint and green Rooibos. 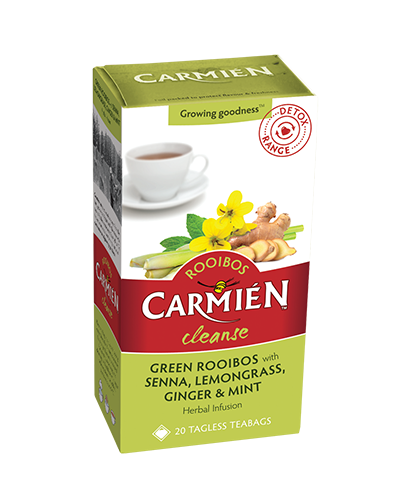 Best to drink in the evenings to give the herbs time to do their cleansing. Senna is known as a mild natural laxative. Lemongrass, ginger and mint soothe and ease digestion and will help relieve the bloated feeling after eating. The best part of your day! 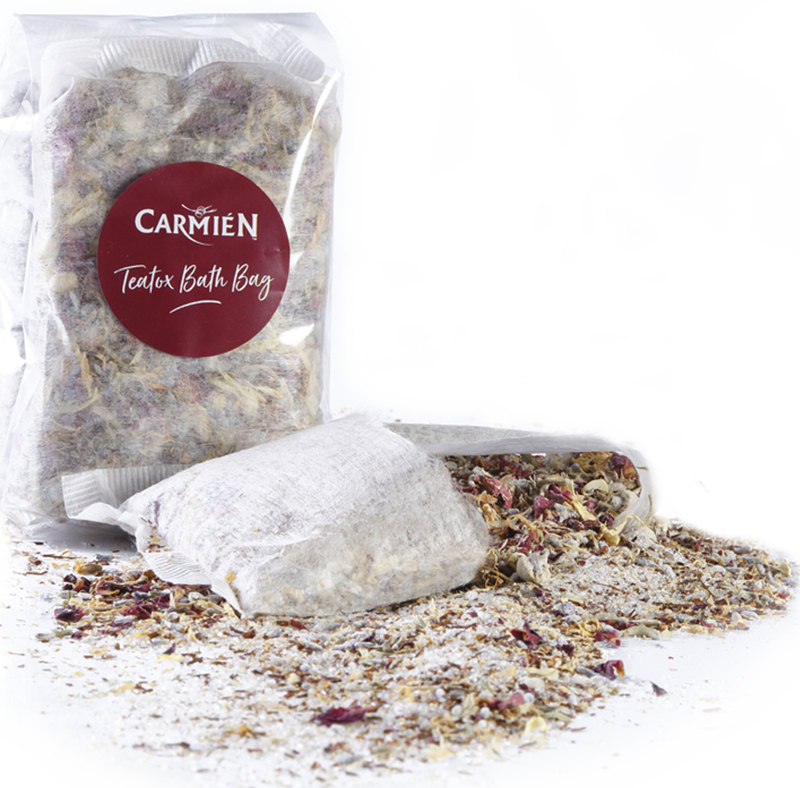 This aids and enhances the body’s natural detoxiﬁcation process. Our bodies get rid of toxins via the liver which converts metabolic waste to water-soluble compounds which is then excreted by urinating. Other waste products are excreted in the bile. A hot bath encourages sweating which is yet another way of eliminating toxins (please be water-wise and respect water restrictions in your area). 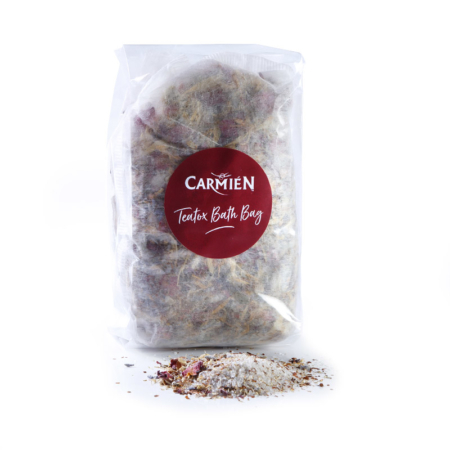 Draw a hot bath and add two sachets of Teatox bath salts consisting of choice rooibos and epsom salt combined with a beautifully fragrant blend of calendula, rose petals, lavender, camomile ﬂowers and rose buds. 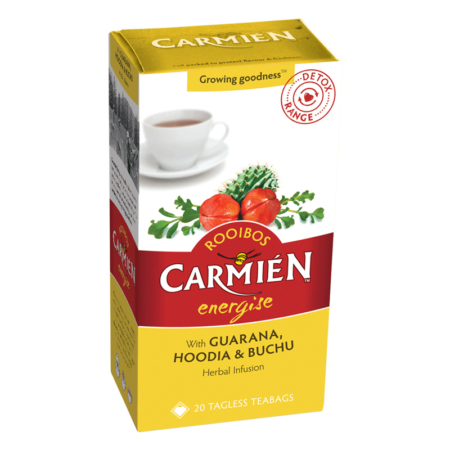 Start off with 1 cup of Energise in the morning and 1 cup of Cleanse in the evening and increase to 2 or more as your body adjusts. 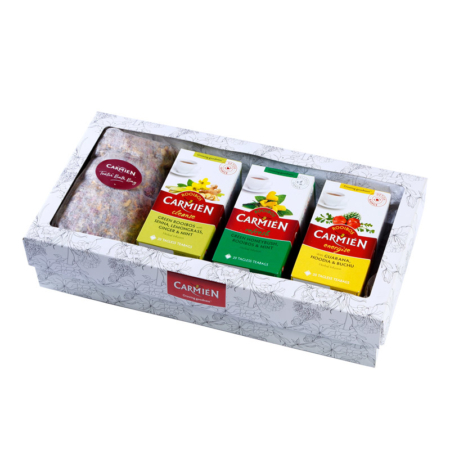 Each person responds differently to the combination of ingredients in the teas, especially its energising and cleansing effects. A stubborn system may require more whereas a sensitive system may find 1 or 2 cups sufficient. Seek professional advice before using if you are under medical supervision. Do not consume this tea if you are pregnant or breastfeeding. Not suitable for children. This product is not intended to diagnose, treat, cure, or prevent any disease. Results may vary from person to person and are not guaranteed. If you have followed the detox program for 14 consecutive days with exercise and a nutrition plan, please share your feedback with us on your favourite social media platform. Remember to consult your physician ﬁrst and include a period of rest afterwards before you feel it’s time for another detox.